Jodo is the Japanese martial art of the short staff. It is focused on striking and blocking against an attacker with a samurai sword. The Kosho School of Karate is one of only a few schools in the United States with a qualified and certified Jo-Do instructor. Our Jo-Do instructor, Nate England, lived in Japan for 3 years studying this art. He has received a 4th degree black belt in Jodo, one of only a handful of people in North America to have achieved this rank. When looking at the jo, one may initially think that it is a simple weapon. However, despite its appearance, the jo is actually one of the most versatile weapons in the martial arts. This is because so many different methods of manipulation can be used with the jo, it can strike like a sword, thrust like a spear, and sweep like a naginata. The jo’s ability to be used in so many different ways despite its simple appearance is what makes it such an effective weapon. During Jo-Do practice, special attention is paid to develop precise form which is directly related to increasing speed, power, and effectiveness. The four most important points when practicing Jodo are Kiai “spirit Unification”, Mai “distancing”, Mitsuke “gaze”, and Zan Shin “remaining mind.” These must be kept in mind at all times, as they are the most important part of practicing Jo-Do. 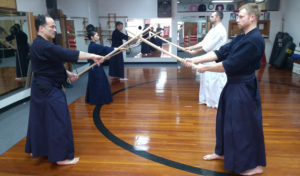 Jo-Do is also an excent means of self defense, if you find yourself in an armed self-defense situation, you will most likely find yourself with a makeshift weapon closer to a jo than a sword, spear, or nunchaku. The Soutai Dosa are a more advanced method of practicing the basic movements of jodo. In this set of exercises, which contains the same series of exercises as the Kihon Dosa, you are working with a partner attacking and defending with a wooden sword. This gives the practitioner a better understanding of how techniques work. Shuri Ryu Karate practitioners may have some familiarity with the techniques of Jo-Do. 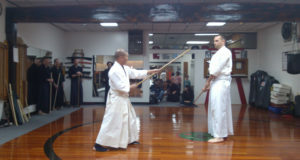 Sensei Terry Sanders, one of Grandmaster Trias’ senior students, studied Jo-Do and sword while living in Japan, and later taught some basic Jo-Do techniques to his fellow students. A basic history of Jo-Do, fundamental techniques, and the kata Ranai was included in Grandmaster Trias’ book The Pinnacle of Karate. Any Shuri Ryu practitioner who is interested in understanding the art of Jo-Do in greater depth is welcome to contact the Kosho School of Karate. Around the year 1600, Muso Gonnosuke was one of the most famous samurai in Japan. He had studied the bo (staff), yari (spear), and naginata (halberd) from the Kashima Ryu school, and he was reputed to be the best in Japan with the 6′ staff. At this time, the most famous samurai in Japan was the swordsman, Miyamoto Musashi, famous for his 2 sword technique and also for authoring The Book of 5 Rings. In order to determine who was better, a match between the two masters was arranged. Unfortunately, Gonnonsuke’s 6′ staff was no match for Musashi’s 2 sword technique, and Musashi was the winner. Humiliated by the defeat, Gonnosuke retreated to the Kamadojinja Shrine on Mt. Houman on the Japanese island of Kyushu. There he meditated and practiced obsessively in order to find a way of defeating Musashi. One night, Gonnosuke had a dream in which a child gave him the knowledge of how to fight with a 4′ staff. Taking this dream as his inspiration, Gonnosuke combined the slashing movements of the naginata, the thrusting movements of the spear, and the grip of the sword to create a new weapon known as the jo. The 4′ jo was considerably shorter than the 6′ bo, which was previously Gonnosuke’s preferred weapon. This shorter length allowed Gonnonosuke to move inside of Musashi’s sword strikes, block more effectively, and attack the body with more power. The shorter length also allowed for lightning fast transitions of the jo from one grip to another, and allowing Gonnonosuke to quickly attack or defend with either end of the weapon. Eventually, Gonnosuke felt confident in his newly developed art and challenged Musashi to another match. This time it was Gonnosuke who was victorious. This was the only time in Musashi’s career that he was defeated. Gonnosuke’s reputation was greatly enhanced by this victory, and he began teaching the art of Jo-Do throughout Japan, naming his school Shindo Muso Ryu. Throughout the next several hundred years Gonnosuke’s art continued to grow and develop. During this time the basic techniques and kata were refined. 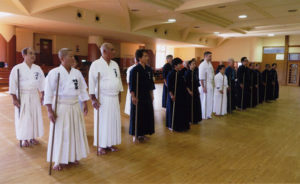 Over the centuries several other styles branched off from the original and some jo techniques were included in the curriculum of various Aikido and Ju Jitsu schools. In Japan, the Zen Nippon Kendo Renmai, (All Japan Kendo Federation) is responsible for overseeing three separate arts: Kendo, Iado, and Jo-Do. Each art has its own separate ranking system and different teachers overseeing it. Jo-Do was officially included in this organization in 1956. At that time there were no single standard set of performance requirements, and each style or school would follow its own traditions. In 1963, a committee of 15 Jo-Do masters was commissioned to compile a set of standardized kata and exercises. This committee faced the daunting task of going through almost 400 years of history, analyzing all of the Shindo Muso Ryu kata, and as well as the numerous variations in the various branches of this art. In 1968 the committee had completed its work and introduced the 12 fundamentals known as the Kihon Dosa (Basic Exercises), 12 Soutai Dosa (Partner Exercises), and 12 Seite Kata (Standard Forms). 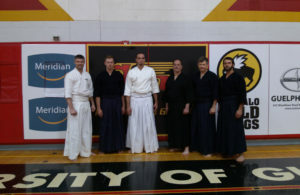 These are the three groups are the basis of modern Jo-Do. The Kihon Dousa (basic exercises), Soutai Dousa (partner exercises), and Seitei Kata (standard forms) are the foundation of modern Jo-Do, and comprise the majority of the art taught in Japan today. While the majority of Jo-Do practitioners only practice these fundamentals, there are others who wish to deepen their knowledge and continue training in the art. These dedicated students can further their training by learning the older, original kata of Shindo Muso Ryu, known as the Koryu Kata. 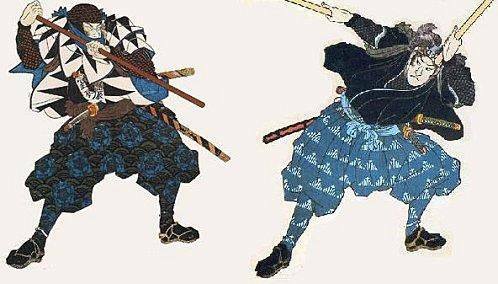 These older forms date back from the time of Muso Gonnosuke and the days of the samurai when actual conflicts and defending one’s life against a sword-wielding attacker was a reality of life. Though similar to modern Jo-Do, they contain many details and nuance that were preserved from this violent era and are not worked in typical training.